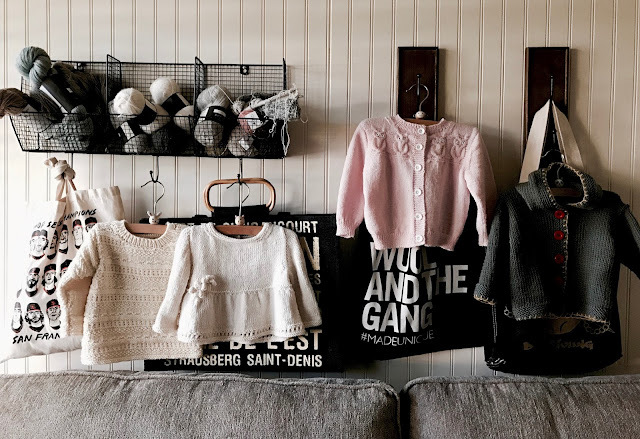 This sweater wall is a happy accident. 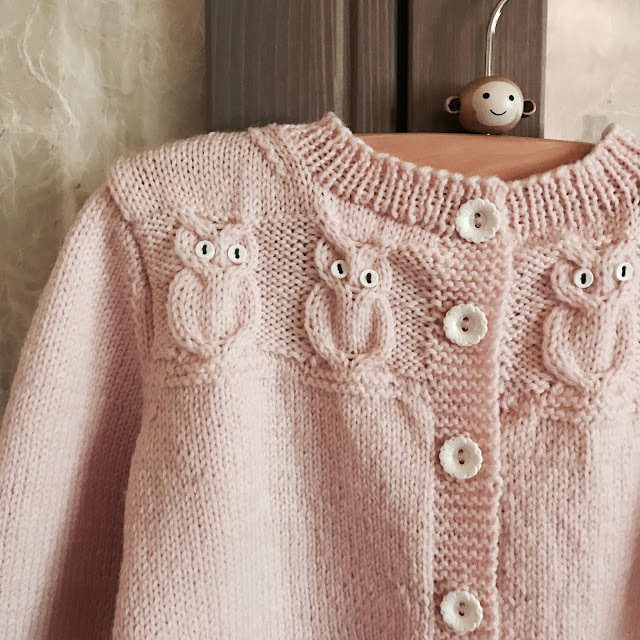 I started displaying baby sweaters in my sewing room so I could admire them while they were awaiting their new home. Seeing them just makes me happy and I'll miss them when they go! 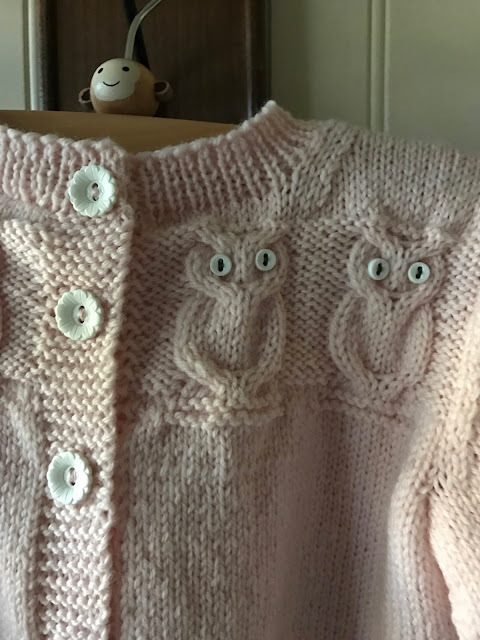 Most are 12 months or 18 months size which I think is a perfect size to knit and to give. Baby will be wearing it in no time and will hopefully be able to wear it for close to a year. 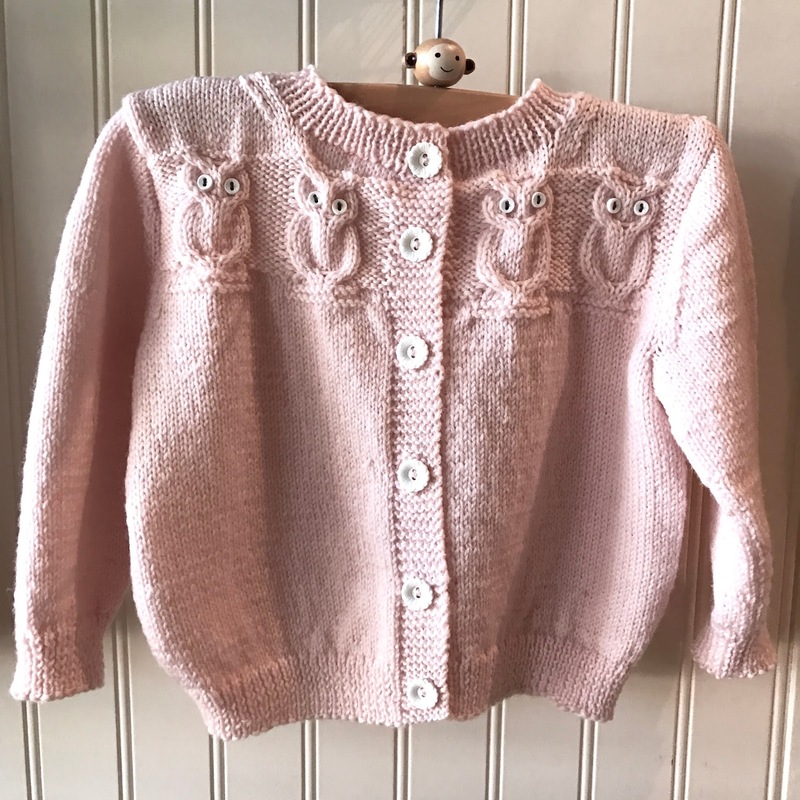 The newest addition to the sweater wall is Penny Straker's original Owl Baby Cardigan in pink. The yarn is skinny, the needles are tiny, (sizes 1 and 2) and is my favorite knit ever as they always come out completely adorable. Long time blog readers will know I've knit a dozen or more from Penny's decades old pattern. The yarn is Dale Garn Baby Ull, a super-soft, well-priced, well-behaved, machine-washable wool that doesn't get the attention it deserves, so I'm here to tell you I love it! Links are at the end of the post. 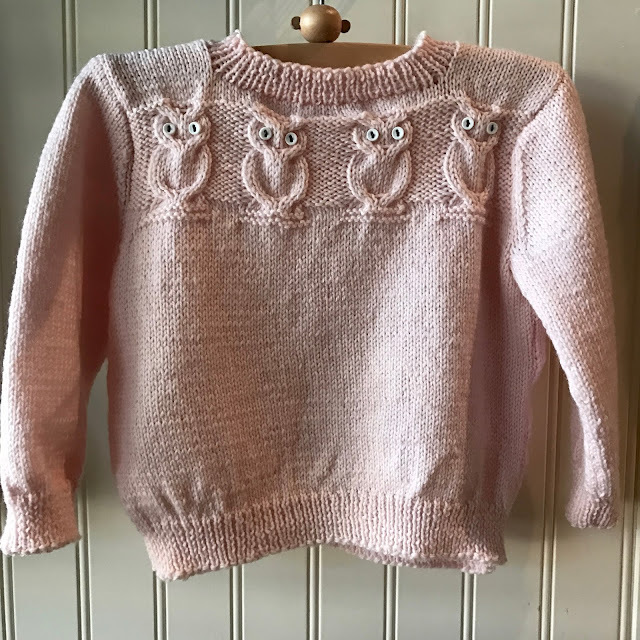 Left to right, Isaac Pullover and Ava Tunic, both by Linda Whaley. Pink Chiffon Owl Cardigan by Penny Straker, and Jump For Joy Hoodie by Universal Yarn. Owl Eye buttons--I've used these, these, these and these, all with good success. You can decorate my walls anytime. Beautiful.......thanks for sharing and inspiring!! Your wall is beautiful. I so enjoy your blog and knitting. Thank you. Super cute! The yarn just arrived yesterday to make the hoodie, can't wait to get started. Oh so many projects so little time. Thanks for all the inspiration. I am in awe of your sweater wall, Kristen! These are just gorgeous!!! Beautiful! Wonderful colors, textures and technique! Could you share your button source? I don't remember where I got the flower buttons because I also pick up buttons on my travels. Thank you sort showing us some of TNNA. Hi Kristen, Thanks for the pictures of the TNNA. I treated myself to a needle organizer and bag from Della Q. Love them both! Have a great day! It's snowing here and I'm at my cozy little shop! Jump For Joy Hoodie, free pattern!